Coming to Hawai’i, McCulloch wanted to keep playing. He put out feelers on social media looking for folks to have a kick with. He got one reply, from a former member of the LA Dragons. That was in the spring of 2017. Nearly two years later, McCulloch now has more than a dozen men and women around him to kick and scrimmage with. He also has the backing of the Australian Consulate in town, and the defending AFL Premiers. 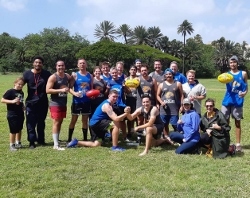 The Hawai’i Eagles officially joined the USAFL as the league’s 43rd team last week. They’ve been holding weekly scrimmages and informal kick arounds for almost a year, and this Sunday will be their first official metro game. Details can be found here. All of that seemed a far way off back in 2017, when McCulloch had put footy on the back burner after the low response to his meetups. He was in a band, working as a musician and tour manager, and was otherwise adjusting to life in his new home. Then, last year, he got a message from another former Austin Crow. Ben Carpenter-Nwanyanwu, who had helped steer the Texan side to three D1 titles and had won the AFL IC17 MVP award with the USA Revolution, had just moved to Honolulu. McCulloch was in Europe on a musical tour, but planned to have a kick with “Chippy” when he returned. Both men reached out to friends who lived in the area and were able to cobble together a group of five to have regular kicks near world famous Diamond Head on Oahu’s south coast, including two people that McCulloch knew through the punk rock circuit. During one of their weekly kick arounds, they were approached by an Aussie named Colin Burrows. 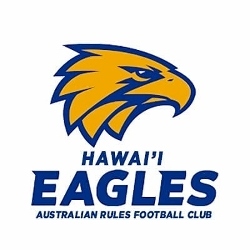 With Hawai’i, the West Coast Eagles now have two USAFL affiliates; the other being the DC Eagles, who have been associated with West Coast since their days with the Baltimore-Washington tag. As the first official metro match draws near, the Hawai’ian side’s dozen or so players are keen to not only establish themselves, but to bring more current and future enthusiasts of the game into their ranks. The mix between locals and Australians has been solid, with a good number drawn from the pub and punk scene in Honolulu. McCulloch believes that in a state where established sports rule, that footy can find a home. That they are so far away from the US mainland is, in McCulloch’s words, a “blessing and a curse. While we probably won't be able to make every tournament in North America due to distance, we are fortunate to be in one of the most desirable tourism destinations on the planet, so hopefully we can bring teams in here. The Eagles are looking to make their inter-club debut at the Western Regionals in Salem, Oregon on July 27th. For now, however, it’s about growing the game and intertwining the culture of the game with that of Hawai’i. The union’s 50th state has an indigenous culture not unlike in Australia, and McCulloch wants his team to inherit the spirit of the islands they represent.